A grown-up treat at Fairfield's Jelly Belly - Wine and chocolate! Main Navigation Current Page: A grown-up treat at Fairfield’s Jelly Belly - Wine and chocolate! 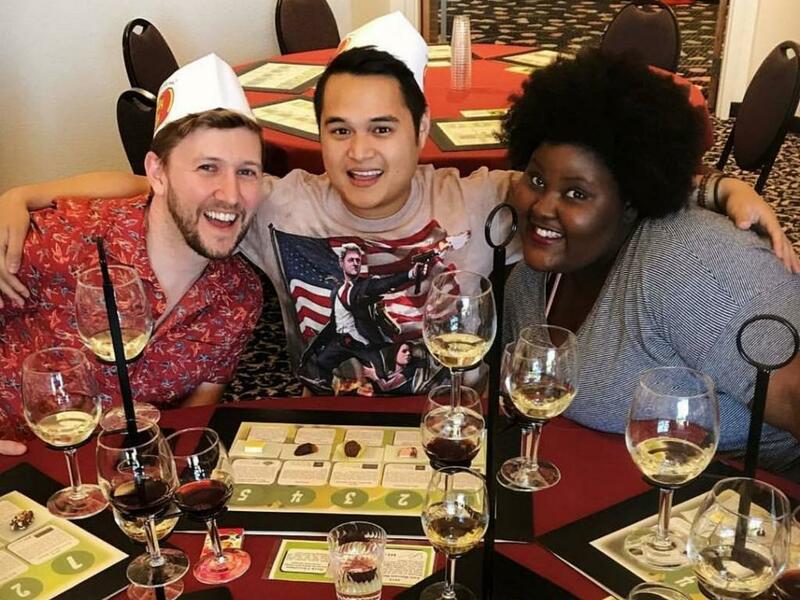 A grown-up treat at Fairfield’s Jelly Belly - Wine and chocolate! The world-famous Jelly Belly Factory in Fairfield, California offers far more than just jelly beans and other delicious candy confections – there’s wine here too! The world-famous Jelly Belly Factory in Fairfield offers far more than just jelly beans and other delicious candy confections – there’s wine here too! Tucked away from the daily buzz of the visitor’s center, inside a large second-floor room aptly titled “Very Cherry,” is Jelly Belly’s Chocolate and Wine Experience. Guests 21 and over are invited inside the Very Cherry Room to enjoy a different kind of flavor than one would find amid the jelly bean samples downstairs. As jazz music plays softly in the background, guests are invited to sample six flights of locally-produced Suisun Valley wines paired with premium chocolate from Jelly Belly’s Chocolate Shoppe. It’s a relaxing – and delicious – experience ideal for any visitor, whether it’s a couple enjoying a weekend away from home or a tour group exploring the area. The Chocolate and Wine Experience is open daily, from 11 a.m. to 4 p.m. There is also a non-alcoholic version available for minors. All guests receive a Jelly Belly souvenir wine glass and 'front of line' access on the free daily tours. And remember, the tasting menu in the Chocolate and Wine Experience changes throughout the year so even if you are a repeat visitor to the factory, you are sure to try something new! Jelly Belly also has individual bottles of each wine available for sale. The Chocolate and Wine Experience is $20 per person for six flights, and $13 for the non-alcoholic experience.